©2005, www.grumperina.com, copyright details at bottom of page. sharfik n. 1 a soft, luxurious scarf I knit for my father, exactly following his 381 specifications 2 a scarf pattern which combines broken rib and loosely-crossed cables 3 the diminutive of “scarf” in Russian, such as “little scarf” or “scarfy-poo” [Russ шарф scarf] 4 a free knitting pattern for a manly cabled scarf :). CO: cast on; BO: bind off; st(s): stitch(es); k: knit; p: purl; RS: right side; WS: wrong side. 3/3LC: slip 3 sts to dpn/cable needle and hold in front, k3, then k3 from dpn/cable needle. Rows 1, 3, 7, 9 (RS): k2, *p2, k6, p2, k1, p1, k1, p1, k1, p1, k1, rep. from *, p2, k6, p2, k2. Row 5 (RS): k2, *p2, 3/3LC, p2, k1, p1, k1, p1, k1, p1, k1, rep. from *, p2, 3/3LC, p2, k2. Rows 2, 4, 6, 8, 10 (WS): k1, p1, *k2, p6, k2, p7, rep. from *, k2, p6, k2, p1, k1. CO 48 sts. (Optional: work a WS row if you need a return row). 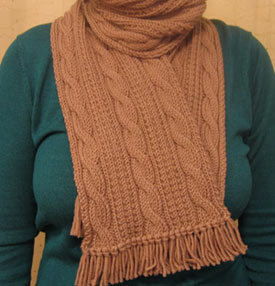 Start sharfik repeat, and work until scarf measures the desired length or you’ve run out of yarn, ending with row 10. BO all sts in pattern. Weave in ends and block lightly. (Optional: attach fringe). questions pertaining to the copyright. 2. This copyright notice must remain intact on every printed pattern. 3. You may use this pattern for your personal fiber pursuits as long as no profit is made from distribution of the pattern or the sharfiks :).